This article originally appeared in our August 2009 issue. You are not about to read a meditation on the virtues of Saint Matthew Ryan, savior of the Atlanta Falcons. First off, contrary to the general perception, he was never a choirboy. Altar boy, yes. Server of Holy Communion, yes. Only player in the history of traveling youth football teams to rise early on a trip to Disney World and beg a chaperone to take him to Mass, yes. But choirboy? Not a chance. You should hear him sing karaoke. Then there is the torrent of money, a dollar a second, as much in a day as his average fan makes in a year. Never mind that he can look into the eyes of the other ten men in the huddle and gauge the mental and emotional condition of each one, tailoring the play accordingly; or that he can lift the mood of this city with the toss of a football; or that once, at the prodding of a family friend, he captivated the room for an hour with a dialogue about pottery. Never mind all that. When it comes to privileged suburban kids who attend costly private schools and go on to become professional football players who live on championship golf courses, I am reluctant to write about goodness. Because I’m afraid you wouldn’t believe me. Would you? Besides, moral history is against him. In the past two decades, two other Falcons quarterbacks were poised for greatness. Both left in disgrace. One was Roman Catholic, just like Ryan, and he could throw the ball seventy-eight yards even with a tired arm. Like Ryan, his first professional pass went for a touchdown. But it was scored by the other team. He caroused his way out of a job. The Falcons ditched him after one season. He was one of Ryan’s boyhood heroes. His name was Brett Favre. Ten years later we had Michael Jordan in shoulder pads, the man who turned the Georgia Dome into an amusement park. No one in football ran faster or threw harder. Late in 2002, when ESPN asked fans to name the most dynamic person in all of sports, he got more votes than everyone else combined. That winter he marched the Falcons to Lambeau Field in Green Bay, Wisconsin, where Favre had gone to become a mortal god, where no visiting team had ever won in the playoffs, and Michael Vick trampled the Packers. His blood-red No. 7 jersey still hangs in my closet. I wear it once in a while, when I want to masquerade as a multiple felon. But one person dared to challenge convention. He is Joe Perrott, a Freudian psychotherapist. I met him in a conference room inside the old stone walls of the William Penn Charter School in Philadelphia, the Quaker high school where he taught Ryan in a course on developmental psychology. The school was founded by William Penn himself back in 1689, and its official seal carries these words: Good instruction is better than riches. When I asked him for the psychological basis of Ryan’s success, he said it must be rooted in the first five years of his life. Everything must have gone right. Then he said something even more intriguing. Ryan was simply too much fun to be a choirboy. Upon further review, I must concur with Joe Perrott. This is the indictment of Matthew Thomas Ryan. Saturday night under the floodlights, circa 1999. Fourteen-year-old Matthew Ryan of the Philadelphia Little Quakers stands under center and takes the snap. They’re down by four with about ten seconds left. One foot from a first down, two from a touchdown. Fullback comes in for the handoff, but he’s all clenched up, so ready to smash someone that he comes in too low. And so, when Matthew hands him the ball, it hits him too high, up by the shoulder pads, and falls to the ground. A defender scoops it up and takes it the length of the field for a touchdown. Game over. Some of the boys cry in the aftermath, and the fullback tells everyone it was a bad handoff, but Matthew refuses to speak in his own defense. He goes off by himself, saying nothing, and when one of the grown-ups searches Matthew’s face for emotion, all he can find is determination. Last Thanksgiving Day, in some woods west of Macon, “Matty Ice” Ryan peered out of a hunting blind toward a deer in the distance. He held a Browning .270 rifle. Matty Ice rhymes with Natty Ice, the nickname of a domestic beer with a desirably high alcohol-to-price ratio, but I am told this is merely a coincidence. Matty Ice refers to the liquid ice that, in popular lore, has replaced Ryan’s blood, thus rendering him supernaturally cool under the sort of pressure and heat that would melt a warm-blooded man down to a puddle. The nickname has become a promotional tool. When Ryan returned to Philadelphia to face the Eagles last year, the headline in the Philadelphia Daily News read ICE MAN COMETH. 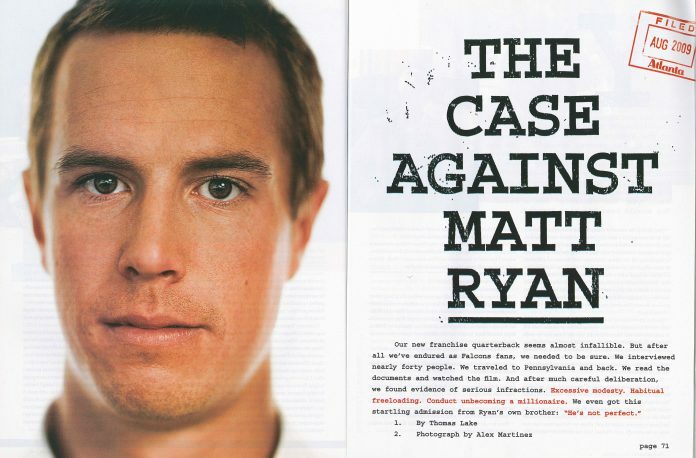 When Boston College was pushing him for the Heisman Trophy in 2007, school officials made a website, Mattyice.com, featuring Ryan firing a football at a sheet of ice and smashing it to translucent shards. To be fair, Ryan didn’t nickname himself. (The culprits are two baseball teammates from Penn Charter, plus a third who resurrected the name on a visit to Ryan at Boston College.) But he has done little or nothing to dispel the myth. Indeed, he has embraced it. High school: Baseball, junior year, state tournament. The Quakers have made it further than expected—all the way to the final game—and suddenly find themselves out of pitchers. “I’ll pitch,” says Ryan, even though he has never started a game before, and he throws a complete game, and the Quakers win the championship. College: A television camera catches him vomiting on the sideline, an act that Matty Ice has conveniently postponed until after the play on third-and-twenty, with eleven seconds left and his team losing 10–7 to Virginia Tech, when he rolled to his left to escape the marauding linemen and then somehow planted his feet and threw back to the right, nearly forty yards in the air, a rainbow in the cold rain, for the winning touchdown. Falcons: We were losing to the Bears, 20–19 on a late touchdown, and the scar tissue around my heart was throbbing again from all those years of Falcons trauma, my Battered Fan Syndrome, and then I looked up and saw six seconds left and we had one more shot. No team but the most desperate will put the ball in a rookie’s hands, but there he was, a shade under six foot five, with smooth cheeks and slender arms, barking out the play. We needed twenty-five yards. The Bears came with the fury of hell, Tommie Harris barreling toward him as fast as 295 pounds can move, and Matty Ice let the ball go just as Harris drove him to the turf. If you look at the video now, you can see the receiver, Michael Jenkins, at the forty-five-yard line when Ryan begins his delivery, and at the thirty when he hauls it in. Ryan had to lead him by fifteen yards and lay the ball in a tiny crease between the corner and the safety and the sideline, which he did, which is why NFL Films analyst Greg Cosell called it the best throw in the league all season. We won the game with a field goal as time expired, and Ryan became the first rookie quarterback since the NFL merger in 1970 to start his first six games and win at least four, and the pressure subsided around my heart. Anyway, the false advertising. There he was in the hunting blind, with his instructor, Chris Redman, the good ol’ boy from Kentucky who preceded Ryan as starting quarterback. Redman enjoys riffing on the nickname when they play golf. Sometimes it’s Matty Slice, which is not quite fair since Ryan recently shot a round of 71, and sometimes it’s Matty Fire, because of the time he disturbed a fire-ant bed and ran screaming across the fairway. Dusk was falling, and Ryan gripped the rifle. The locals said a massive buck had been roaming the forest, but the buck was not in sight. A doe appeared. Redman encouraged Ryan to fire. The pressure mounted. A venison dinner hung in the balance. Matty Ice breathed hard and his hands shook. He lowered the rifle. They ate Thanksgiving dinner at Chick-fil-A. The evidence is an excerpt from Ryan’s personal page in the 2003 Penn Charter yearbook. Mom and Dad: Thanks for sacrificing so much just to give me the opportunity to go to Penn Charter. I can’t tell you how grateful I am for everything you have given me. Words can’t express the love I have for you. Kate: Thanks for being the best sister. All the advice you have given me will last me a lifetime. Motts: You’re the best older brother anyone could have. Thanks for being my biggest fan. John: You got the house to yourself, enjoy. Never change, you are the nicest kid ever. Pop: Thank you for your support and advice. I’ll always remember to play with a bat, ball, and a glove, not my mouth. Whitney: The past two years have been incredible. I want you to know that where ever our paths take us, you will always have a special spot in my heart. Daly: You’re out here in L.A. working with Axe Hair? Daly: What-what-why? (Laughter from the audience.) What is that? You look good. You wear a helmet all the time. Ryan: That’s the key . . . I’m spending most of my time in the helmet, and I teamed up with Axe Hair, postseason (waves hand at own head), to kinda get my act together off the field, and, and, um, they’ve done that. I mean, I’ve used some of the product. It’s been great. My girlfriend loves it. Ryan: Which is huge. I mean, it’s big to keep her happy. Daly: Well, let me say, and this may be a bit of a gay moment, but your hair looks beautiful. It looks fantastic. I am going to respectfully decline your invitation to interview, and wish you best of luck on the profile. I am sure it will be wonderful! I’ll bet Matt got no shaming at all. He’s totally unafraid of adverse public opinion. More remarkably, Ryan had done the opposite in high school. He threw the ball only occasionally. His head coach, Brian McCloskey, gave him the latitude to call any play he wanted at the line of scrimmage, and Ryan usually chose to hand it off. In the league championship game of his senior season, a 35–21 victory for Penn Charter, running back Tony McDevitt gained 328 yards and four touchdowns. Ryan threw for just thirty-four yards. “It’s nice to put up big numbers, don’t get me wrong,” he told the Philadelphia Daily News after the game, “but it’s more important to win.” Tall quarterbacks are prized by college and pro scouts because they can see over massive linemen. Had Ryan not been six foot five, that might have been the last game of his football career. The football makes a sound when it leaves Ryan’s hand, a slight whistling hiss as the laces revolve. He does not throw hard by NFL standards, but his receivers in high school were unaccustomed to such velocity. He never punished them for dropping the ball. In fact, he often threw right back to the butter-fingered wideout, just to restore his confidence. “Oh, it’s my bad,” he would say, even though they both knew whose bad it really was. “He don’t even have a Gameday Car,” White said. On the Falcons, and possibly around the NFL, many players keep a special car just for Sunday drives to the stadium. As such, the Spanish Gold Chrysler is not Roddy White’s Gameday Car. That job belongs to his black Maserati. Michael Turner’s Gameday Car: a Mercedes SL coupe. Michael Jenkins comes in a Porsche; Jamaal Anderson in a Bentley; John Abraham in a Ferrari. And Matt Ryan, who could buy any of these vehicles with less than one week’s pay? It was time to ask Ryan about all this. I set up an interview for 8:45 one morning, but there was a communication mix-up and Ryan showed up at 8:10. He’d been waiting idly for twenty-five minutes by the time I arrived, which, at roughly $60 a minute, had cost the Falcons $1,500 worth of wasted time. I tried to explain, but his handlers told me to get on with the interview. Ryan was sitting at a wooden desk in a vacant office across from a dry-erase whiteboard. Morning light poured through the window behind him. He had a tall Styrofoam cup full of a steaming beverage, and despite the theft of his precious time, he was smiling as if nothing was wrong. I fumbled for my list of questions and my digital recorder. My heart pounded and my hands shook. What followed was perhaps the worst interview I have conducted in eight years as a reporter. Me: Um, wondering if you could tell me about, uh, your Ford truck. Me: And when you say, um, you go home after, after practice, and you have dinner, I mean, do you cook for yourself? Or does somebody cook for you? How does that work? Ryan: Uh, sometimes. Sometimes I cook. Um, my girlfriend cooks a lot too, ummm, or it’s takeout. (Brief chuckle.) The Carrabba’s is right down the street, so I get Carrabba’s (chuckling pause) a good amount. Ummm, Whole Foods, go to Whole Foods a lot, so, you know, those are just some of the different things. That’s kinda, I think it’s a lot like everybody else, you know, sometimes you cook, sometimes you grab something real quick. I’m a big Subway guy. Falcons Spokesman: Hey Tom, we got about five more minutes, buddy. He’s got a session at nine he’s gotta go to. Me: Thanks for the interview. Me: Is this gonna be, do you think we can talk again at all, or, uh . . . Spokesman: We’ll work on it. Ryan: We’ll get that set up, so . . . I’m gonna run in, but it was good seein’ you, man. Me: Really good to see you, Matt. The fifth-grade classroom of Beverly Stanton at Saints Philip & James School holds no discernible residue of Catholic guilt. This is no place for the rapping of knuckles. On the wall above the blackboard, Mrs. Stanton’s favorite saying is written in large blue letters: “At a special moment in time God created you.”Mrs. Stanton wore a leaf-green sweater set, a heart-shaped silver pendant, and a perfect dome of grandmother hair. “I actually taught Matthew in this room,” she said. “I’ve used him as a role model with my students.”She reminisced for a moment. Mrs. Stanton pointed to a yearbook photo around which she had glued rays of construction paper in Falcons black and red. Beside the picture, all those years ago, Matthew listed his goal in life: To be a professional football player. She said Matthew’s life is a lesson to her students. Dream big and work hard. Nothing is impossible. 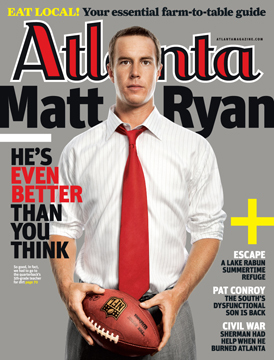 According to Matt Ryan, as quoted in various media, Matt Ryan has tons of room to improve, miles to go on decision-making and accuracy, and those third-down conversions were the result of great protection and great routes, and he’s pretty darn lucky to be around such great teachers of the game, and all this attention is flattering but it must be because he’s on such a great team. Aw, shucks. He could go on for days about how he’s surrounded by geniuses and supermen, all of whom deserve most of the credit for anything he’s been fortunate enough to personally accomplish. It’s not bragging if you’ve done it. The ritual humiliation of first-year professional football players at the hands of their veteran teammates has taken many forms over the years, including ice baths, shaved eyebrows, and forcible binding to goal posts. On the Falcons, the cruelty comes in a subtler package. Rookies must stand before their colleagues and sing a capella. They may choose the song.The veterans made a crucial error with the rookie Ryan. They gave him advance notice of his performance.By then they should have known of his near-photographic memory and his maniacal penchant for preparation. A good quarterback must have these attributes, because his job, on balance, is the most difficult in sports. The Falcons’ playbook is more than three inches thick. Most players need only know a fraction of it, but Ryan must know the whole thing. The plays have names such as Zero Dos Toss Thirty-Nine Tank Check and Y-Motion to Zero Strong Sixty-Two Comet Sink. I have no idea what those words mean. They are coded instructions to his teammates, governing such decisions as when the guard will pull, when the running back will jab-step, how far back Ryan will drop to pass (Three steps? Five? Seven? ), and countless other permutations, all of which could change at the last instant in the ongoing effort to trick the eleven defenders, who are themselves always trying to mislead Ryan about their own plan of attack. This is why Ryan is usually the first player to arrive at the practice complex and the last to leave; and why he has the game plan faxed to his house in Duluth on Tuesday night instead of getting it Wednesday like the others do. The mind must be fresh to process such volumes of information. Ryan usually goes to bed by 9:30 p.m. But before retiring on the eve of his solo concert, he did some rehearsing. He went online to study some lyrics. And in the team meeting room the next day, he sang the Aerosmith tune “Janie’s Got a Gun,” the Rick Springfield classic “Jessie’s Girl,” and Journey’s “Don’t Stop Believin’” with passion and authority. Mind you, Ryan is neither a crooner nor a choirboy. But he held nothing back. He wailed on his air guitar. He turned his face to the ceiling. He roared. Humiliation? No. Ryan was clearly enjoying himself. Taylor Pork Roll is a delicacy of New Jersey and eastern Pennsylvania—not quite ham, not quite sausage. The Ryans are a well-to-do family, but they are not above eating Taylor Pork Roll, or, for that matter, scrapple. Southerners have no monopoly on inventive uses for pork. In any case, Exton is twenty-seven miles west of Penn Charter, a long drive through morning rush hour, and young Matt Ryan used to carpool with the Rogers family. He was always chipper, even at 7 a.m., which of course is a rarity in a fourteen-year-old, and he greeted Mr. Rogers with an enthusiastic, “How ya been?” Mr. Rogers made Taylor Pork Roll sandwiches for breakfast, and he usually had an extra one for Matt, because he knew Matt loved Taylor Pork Roll. Granted, Ryan was never late, and he brought in the paper and took out the trash, and he let the Rogerses’ English bulldog, Max, jump into his lap, and he made sparkling conversation with Mr. Rogers’s seventy-eight-year-old mother-in-law, who was on oxygen, but there is no evidence he ever paid Jack Rogers a dime for those Taylor Pork Roll sandwiches. In the end, I got only one story about Ryan’s first five years. It did not come from his mother, Bernie, who declined to be interviewed, or his father, Mike, who found himself walking a tightrope during my visit to Exton. Mike Ryan is his own boss—in fact, as founder and president of the telecommunications firm Linecom, he’s boss of about fifty people—but here, after consulting with his son and his son’s agent and officials from his son’s team, he had a delicate mission, which of course he accomplished. Matt is a good son, a thoughtful son, and he does not want his fame to encroach on his family’s privacy. But he knows fame is part of his job now, a commodity that sells season tickets, and so he plays along. And so his father plays along. He took an hour out of a Tuesday afternoon to drive me around Exton in his black Nissan Pathfinder, showing me their old house and Matt’s old school and Matt’s old Little League field and the family’s favorite cheesesteak joint, cooperating politely, revealing very little. I told Mike Ryan about Joe Perrott’s hypothesis, that everything must have gone right in Matt’s first five years. I asked him if Matt ever did anything wrong. I asked him what incident came to mind. Mike Ryan thought for a moment, then said something about Matt getting in some kind of a schoolyard scuffle when he was eight or ten. Details were scarce. When the tour ended, he dropped me off in the parking lot of the Holiday Inn Express. “I don’t have any tremendous revelations to give you,” he said, which meant I still had no story about Matt’s early childhood, and only two more people to ask. As quarterbacks, Michael Vick and Matt Ryan have almost nothing in common: Vick is a short, left-handed improviser who could outrun a beam of light; Ryan is a tall, right-handed pocket passer whose own father calls him two steps slower than a statue. Nevertheless, with 2:49 left in the third quarter of last year’s game against the Vikings, Ryan tried to pull a Vick. Second-and-goal from the six-yard line. Falcons lead 17–7. Three receivers bunched to the left. Ryan back to pass. Looks left. Looks left. Nobody open. At the twelve he puts the ball down and takes off running. Three yards from the goal line he is cornered by two purple defenders. Does he curl up? Does he slide? No. Even with a ten-point lead and at least one more available down, Ryan leaps. Naturally, a Viking takes out his knees. This is what good Vikings do in the face of an invasion. Ryan flips in the air and lands on the goal line, headfirst, losing the ball in a pile of bodies, and I hold my breath, hoping against spinal fracture.Back to that story in a moment. I met Motts Ryan at Panera Bread near the Philadelphia Main Line, seven hours before my scheduled departure. He was even better-looking than his little brother, with short, sandy hair that stood on end with no crusty evidence of styling product. He works in the family business and has diversified into real estate on the Jersey Shore. He is still Matt’s best friend. They talk on the phone almost every day, which means, among other things, that like his father he understands the rules of media management: Smile and cooperate, but never stop circling the wagons. This is more profound than it first appears. Luck, happenstance, divine providence: However you explain it, the game of life does seem rigged in Matt Ryan’s favor. Just look at his career compared with two relatives who also happen to be quarterbacks. Matt’s uncle John Loughery was also a starter for Boston College, almost thirty years ago, and he taught Matt how to hold the football: softly, leaving a gap in the well of the palm, relaxing the index finger from knuckle to tip. Uncle John injured his hand before his junior season. He was replaced by Doug Flutie. Motts Ryan (real name: Michael) was a quarterback too, for Widener University, faster and more agile than Matt but five inches shorter. He and Matt used to spend hours in their backyard practicing fade patterns and punt returns. On May 19, 2001, two days after Matt’s sixteenth birthday and just after Motts’s freshman year in college, they were waiting to make a left turn into the Kimberton Golf Club when another car smashed Motts’s Volkswagen Jetta from behind and shoved it into the path of a National Guard fuel truck. Motts was knocked unconscious. The Jetta’s engine caught fire. Matt got out and tried to put out the fire with his windbreaker. Fortunately, someone had a fire extinguisher. Motts was extracted from the wreckage with the Jaws of Life. He suffered a fractured skull, a broken left hand, a broken right humerus, and a shattered right elbow. He had six surgeries to try to fix his elbow. No luck. He never played football again. His brother walked away with nothing more than a broken ankle. The rest is familiar. The Falcons, picked by the Sporting News to go 1–15, finished 11–5, made the playoffs, and came within one third-down stop and one good drive of knocking off the Arizona Cardinals, who themselves were a toenail from winning the Super Bowl. Ryan was named NFL Offensive Rookie of the Year. But first he had to finish his foolhardy play against the Vikings, the one where he leapt for the goal and landed helmet-first. He got up, unharmed, and his teammate Justin Blalock recovered the fumble in the end zone for the touchdown that sealed the game. Here is the only story I know about Matthew Ryan’s early childhood. It comes from his sister, Kate, who loves him dearly. One Christmas morning, when she was eight or nine and Matthew was three or four, she persuaded him to defy family tradition. Santa Claus had come the night before, leaving unwrapped presents on the living room floor. Consequently, the Ryan children were expected to wait at the top of the stairs until their parents got up around 7:30. It was barely 6 a.m. when Kate led Matthew down to the living room. She is not certain what her Santa gift was that year. Possibly a ten-speed bicycle. But she remembers that Matthew got a bouncing horse.Justice was swift when the violators were discovered. Kate was sent to her room to wait till the others finished opening presents. For her, it was the worst Christmas ever. But Matthew stayed downstairs with his new toys, bouncing on his new horse, and as far as I know he got no shaming at all. This last charge is the strongest of all, because I saw the violations myself. One Friday this May, at the Falcons’ minicamp in Flowery Branch, Matt Ryan threw two interceptions. That was worrisome. The Falcons’ 2009 schedule is much tougher than last year’s (road opponents include Dallas, New England, and the New York Giants), leading some oddsmakers to predict they will win fewer games than they did in ’08. Ryan, whom Fox Sports recently named the league’s best franchise player under the age of thirty, is under tremendous pressure to prove them wrong. All off-season, in one interview after another, he had been talking about improving his decision-making and accuracy, and there he was, giving the ball away again.After the session, I asked Falcons offensive coordinator Mike Mularkey about Ryan’s throws. He said in both cases the receiver had run the wrong route. Neither interception was Ryan’s fault. Ten days later, Ryan appeared at The Capital Grille in Buckhead for Huddle Up for Miracles, a charity event that raised more than $190,000 for Children’s Healthcare of Atlanta by casting Falcons players and coaches as waiters and encouraging the city’s wealthy businesspeople to give them large tips. Someone brought a karaoke machine. Just before dinner, as guests arrived in their BMWs and Escalades, I sat down with Ryan for a short interview in a private dining room. I asked him about that Friday of minicamp. He knew exactly the plays I meant, and he had ample opportunity to tell me why they were busted. But he did not. And then, after claiming he would not sing that night, he took the microphone for a guest spot on a teammate’s rendition of “Don’t Stop Believin’.” The melody escaped him, but he roared on, eyes to the ceiling, jugular pulsing, holding nothing back.